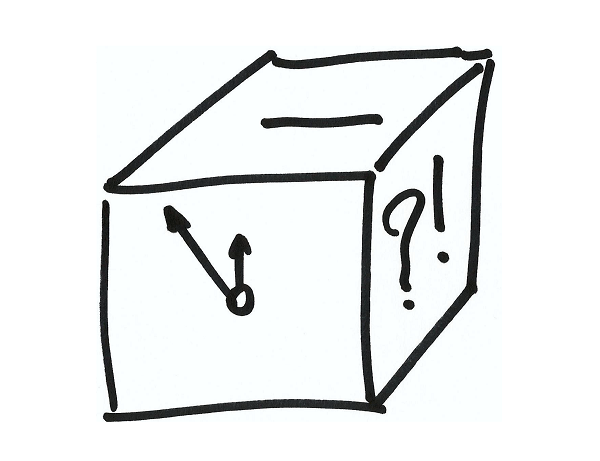 Home›Archive›WEEKLY ANALYSIS: Will there be elections on December 11? WEEKLY ANALYSIS: Will there be elections on December 11? The closer we get to the agreed date for early parliamentary elections on December 11, for which the four political parties of SDSM, VMRO-DPMNE, DUI and DPA have gaven their signatures, the greater the uncertainty is on whether this time there will be voting. An increasing number of citizens are once again expressing their doubts on whether the ruling VMRO-DPMNE will agree four months prior to the early parliamentary elections, and following the “Wiretapping” affair in which numerous former and current politicians and government official have been involved, to face the trust of voters. Political scientists estimate that the government will try to “buy” time, and invest budget money in staged parades with ribbon-cutting that will mark the start of unrealized, yet promised projects for the entire past decade. 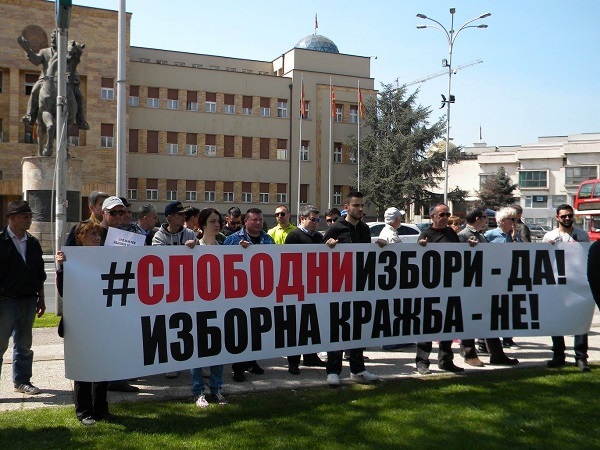 Statements of representatives of the Citizen Movement for Defense of Macedonia (GDOM), which clearly has a pro-government sign, also speak in favor of citizens’ predictions, in that if opposition leader Zoran Zaev were to allegedly plot federalisation right before elections, at the protest scheduled for tomorrow (on the day of the national holiday October 11), that the people would massivly rise to protest without even organizing a counter-protest! 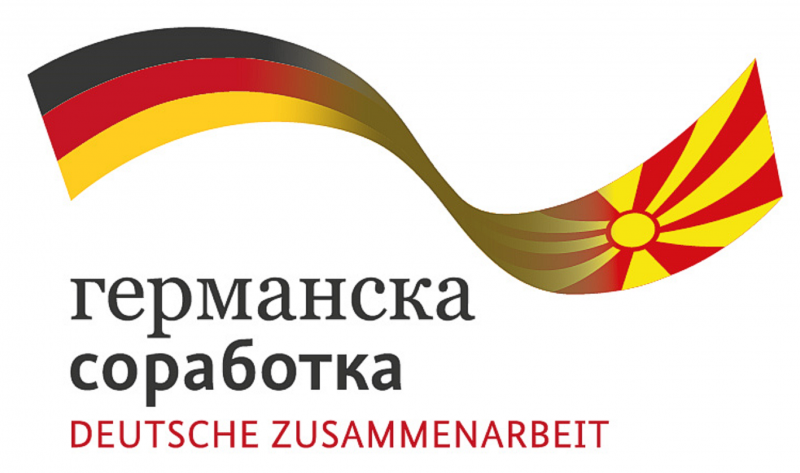 The international factor demands from the Macedonian relevant political subjects of both blocks, the Macedonian – SDSM and VMRO-DPMNE and the Albanian – DUI and DPA, to abide by the Agreement reached on August 31, with which they guarantee serious and consistent efforts for reforms in the Voters Register, in the MOI and in the media, as well as for unhindered work of the Special Prosecutor’s Office (SPO), as imperatives that are to peacefully bring Macedonia to credible elections, which with the election of a new government will resolve the long-term crisis. 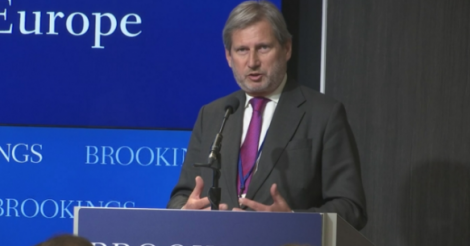 On Friday (14.10.2016) European Commissioner Johannes Hahn will visit Skopje. As European Commission spokesperson Maja Kocijancic has announced, he will meet with the leaders of the four political parties, signatories to the Przino Agreement, in order to underline the importance of holding the elections, but also the importance of implementing the agreed reforms. 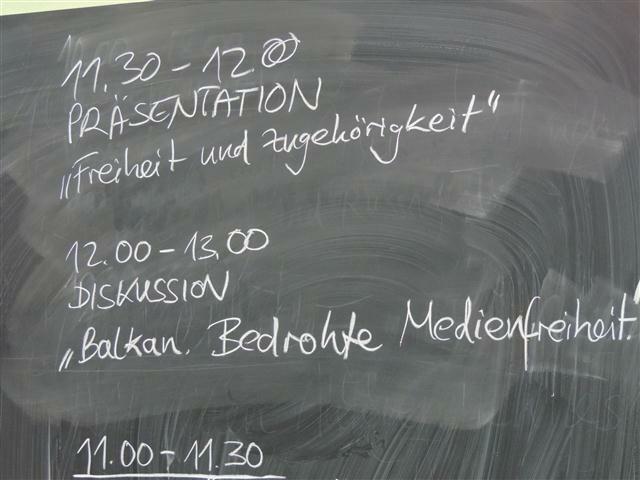 Hahn will also meet with representatives of civil society, and with the SPO. The Parliament did not pass the Draft Law on amending the Law on the SPO and the Draft Law on changing the Law on Witness Protection, which are to ensure unhindered work of the SPO until all criminal acts arising from the materials related to the “Wiretapping” affair have not been completed, which the leader of the opposition, Zoran Zaev, opened a year ago. The VMRO-DPMNE parliamentary group remains at its position that it will not accept any consideration of any request of the SPO. According to VMRO-DPMNE, for the SPO – the Parliament is illegitimate, so it is unclear how they can request from Parliament changes to laws. This party also reacts because the SPO has not submitted a financial report on its work, and has a budget of over 60 million denars. The Democratic Union submitted the Draft Law on amending the Law on the SPO and the Draft Law on Witness Protection by regular parliamentary procedure, but its leader Pavle Trajanov, Member of Parliament, did not attend the session on the voting of these laws requested by the SPO, and proposed by SDSM in a shortened procedure, which did not receive a majority of votes. 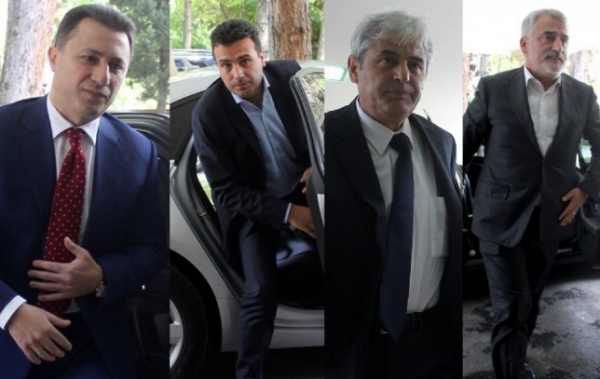 The Uniteti party strongly reacted to, according to them, “the hypocritical behavior of the two Albanian parliamentary parties DUI and DPA”, signatories to the Przino Agreement, in regards to the laws that support the work of the Special Prosecutor’s Office. They believe there is no excuse for the Albanian Members of Parliament, whose parties constantly state that they support the work of the SPO, to not support the legislative amendments concerning this issue and that with their actions they are protecting themselves and the Macedonian partner in government. This, according to them, is just confirmation of “their vassal relationship towards the Macedonian partner, but also of the fear of losing power and of the rule of justice”. 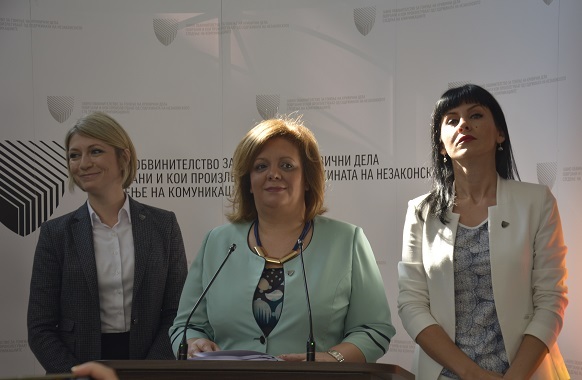 Representatives of DUI and DPA were called in for talks in the US Embassy in Skopje, following the voting on the proposals for changes in the laws – for the SPO and for protected witnesses. 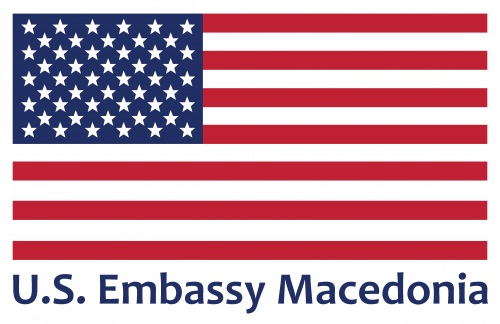 The US Embassy also issued an announcement in which it encourages all parties to abide by the commitments undertaken with the agreements from Przino also from July 20, in order to ensure credible elections and unhindered work of the SPO and of the independent media observers. The Embassy assured that the requests of the SPO for support of a thorough and independent investigation of facts are reasonable. At a press conference, LDP demanded answers from VMRO-DPMNE on whether the property of the party is worth 60 million euros, which makes the party the richest one on the European continent, and whether it is true that the party owns 33,000 square meters on buildings, pastures and agricultural land. Transparency International expressed dismay concerning the non-adoption of the changes to the laws proposed by the SPO, and considers that the proposed changes are of great importance in the fight against corruption that is currently taking place in Republic of Macedonia, and that appropriate protection of witnesses is crucial in carrying out investigations in corruption cases. The judge of the preliminary procedure in the Basic Court Skopje 1, passed a decision that orders a stop to the financial transactions of the accounts of the firm DTU “Finzi” LTD Skopje. With this, actually, the request of the SPO is accepted for determining temporary measures on prohibiting the use and disposal of the transaction account of the legal person in the “Trezor” (Vault) case. Whereas, the Criminal Council of the Basic Court Skopje 1 rejected the appeal of the SPO on the decision of the preliminary procedure judge that detention for Goran Grujoski is not required, the first suspect in the “Trezor” (Vault) case. The Supreme Court, however, accepted the appeal of the SPO on the decision of the Court of Appeal regarding house arrest for the Mayor of Bitola, Vladimir Taleski, which has returned the case back for retrial. Goran Grujoski, who is accused and suspected in two cases of the SPO, according to some media has recieved a promotion in the Mininistry of Interior. He was “moved” several levels upwards by the Director of the Directorate for Security and Counterintellegence, and is now an assistant director for coordination in the MOI. 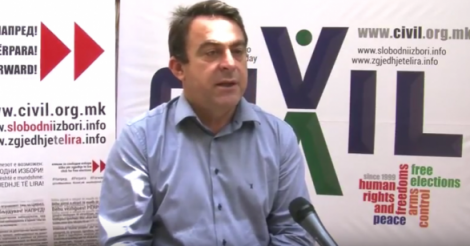 The promotion is an act made by former Minister of Interior Mitko Cavkov, who in leaving the top position signed the decision on Grujoski’s new job position. According to the current position, all five directorates in the MOI are under the control of Grujoski. Grujoski is charged in the SPO case for destroying offical documents in the Directorate for Security and Counterintellegence and is a suspect in the case “Fortress”. Previously in his new position was Toni Jakimovski, who also is a suspect in the case “Fortress”. He too has been promoted to –Director General of the Southeast European Law Enforcement Centre (SELEC), with headquatreters in Bucharest. Chavkov, as a Minister of Interior conducted other changes in the MOI as well, with the purpose of bringing “reliable people” to the top positions. Before being dismissed from his ministerial function and appointed as Director of the Public Security Bureau, he also changed the rules for the systemitization of the MOI. 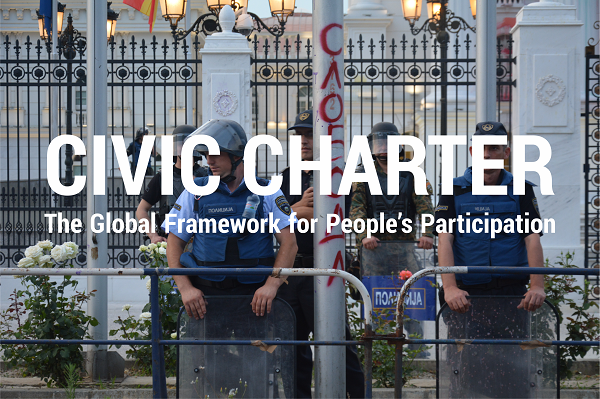 Criminal and misdimeanor charges are being filed in several cities in Macedonia against citizen activists of the Colorful Revolution, ahead of the upcoming elections. In Skopje, the trial of Pavle Bogoevski was postponed, one of the most prominent “colorful revoltuinaries”. He is charged with the criminal act of “participating in a crowd”, for which a fine and an imprisonmentt of up to three years is anticipated. 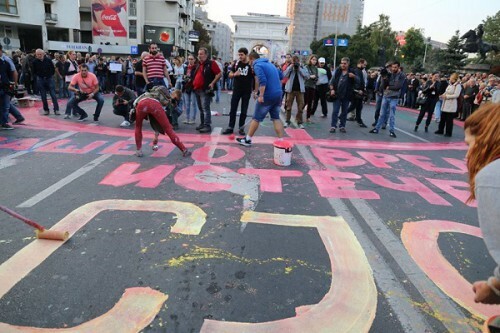 Participants in the Colorful Revolution did not miss the oppurtunity to protest in front of the Criminal Court in Skopje, demonstrating support for Bogoevski. In Prilep there are four court hearings in procedure in which lawyer Zare Stevanoski is charged for obstructing and endangering traffic, by writing the grafiti “you will be doing time”, on the street in front of the City house. In Gevgelia participants of the Colorful Revolution recieved penalties for payment of fines, by public enterprises. 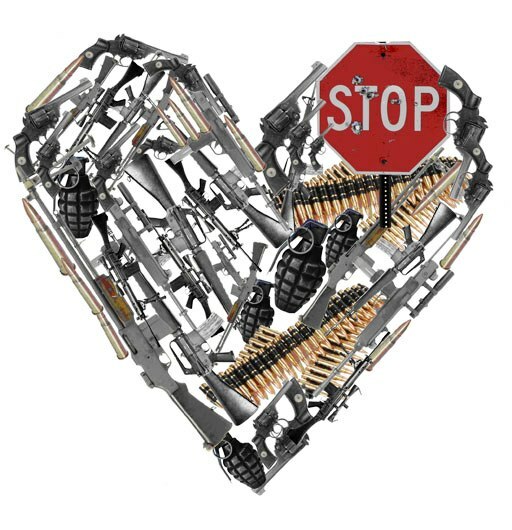 However, citizens in other cities are refraining from expressing public support to the participants in the Colorful Revolution. 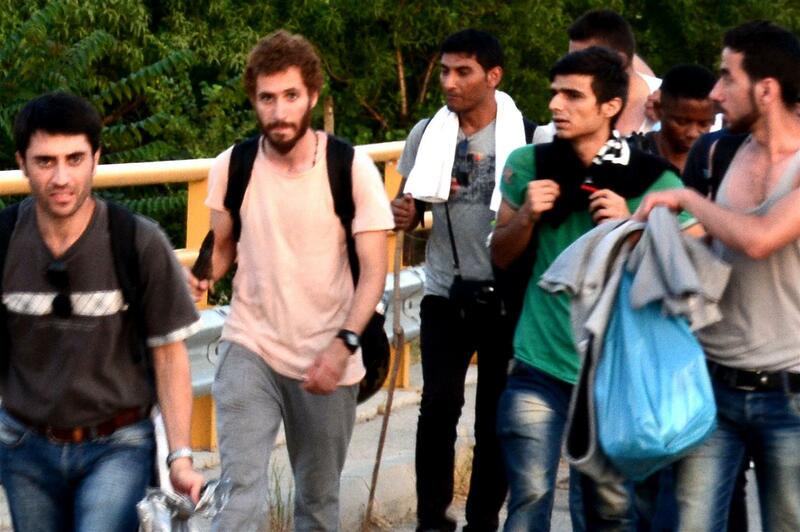 Media Darkness in Macedonia: let’s shed more light into the tunnel! WEEKLY ANALYSIS: Elections or deepening of the crisis?